“At one point in his career, Albert Einstein was asked by a small local organization to be the guest of honor at a luncheon and to give a lecture about his research. He agreed to do so. The luncheon was quite pleasant, and when the time came, the host anxiously announced that Albert Einstein, the famous scientist, was here to talk about his theories of special and general relativity. Einstein took the stage, and looking out a largely non-academic audience consisting of mostly old ladies, he explained to them that he certainly could talk about his work, but it was a bit dull, and he was thinking perhaps instead the audience would prefer to hear him play the violin. The host and audience both agreed that it sounded like a fine idea. 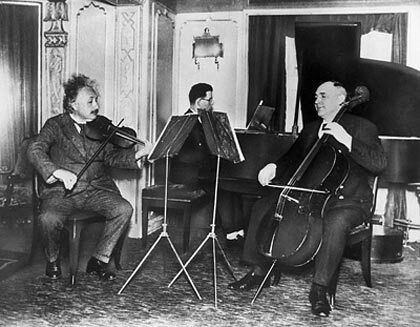 Einstein proceeded to play several pieces he knew well, creating a delightful experience the entire audience was able to enjoy, and surely one they remembered for the rest of their lives. Einstein was able to create such a memorable experience because he knew his audience. As much as he loved thinking and talking about physics, he knew that it wasn’t something that his audience would be really interested in. Sure they asked him to talk about physics, because they thought it would be the best way to get what they really wanted – an intimate encounter with the famous Albert Einstein. To create a great experience, you must do the same as Einstein. You must know what your audience will and will not like, and you must know it even better than the do. You would think that finding out what people want would be easy, but it isn’t, because in many cases, they don’t really know. They might think they know but often there is a big difference between what they think they want, and what it is they will actually enjoy.